The cell membrane is made mostly of a double layer of phospholipids, which envelopes the cell and separates its interior from its environment. 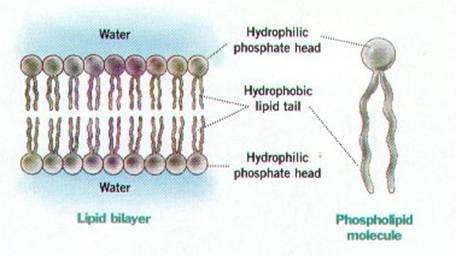 A phospholipid molecule has a hydrophilic (water-loving) phosphate head and two hydrophobic (water-hating) fatty-acid tails. By forming a bilayer with their tails intertwining, they are able to form a separation between the watery inside and outside of the cell. At body temperature, membranes are a liquid with a consistency similar to cooking oil. All human cells acquire the nutritional molecules and ions they need from their surrounding extracellular fluid. This is also where the cell "dumps" its waste. Thus, there is an unceasing traffic of molecules and ions in and out of the cell through the cell membrane (E.g. glucose, Na+, Ca2+), and also through its organelle membranes (E.g. proteins, mRNA, Ca2+, ATP). Typically, the cells are located in close proximity to the blood vessels, which supply nutrients and oxygen and pick up waste to and from the cells (substances are transferred by diffusion between the capillaries and the extracellular fluid). The cell membrane serves as both a gateway and a barrier for the cell and is said to be "semi-permeable". It can either allow a molecule or ion from the extra-cellular fluid to pass through freely, pass through to a limited extent or not pass through at all, thus regulating its interaction with its environment. The cell membrane also contains cholesterol, which serves to "waterproof" the cell.